Automotive and battery manufacturers continue to make headlines around electric vehicle plans. Lithium majors and juniors position themselves for future growth trends. 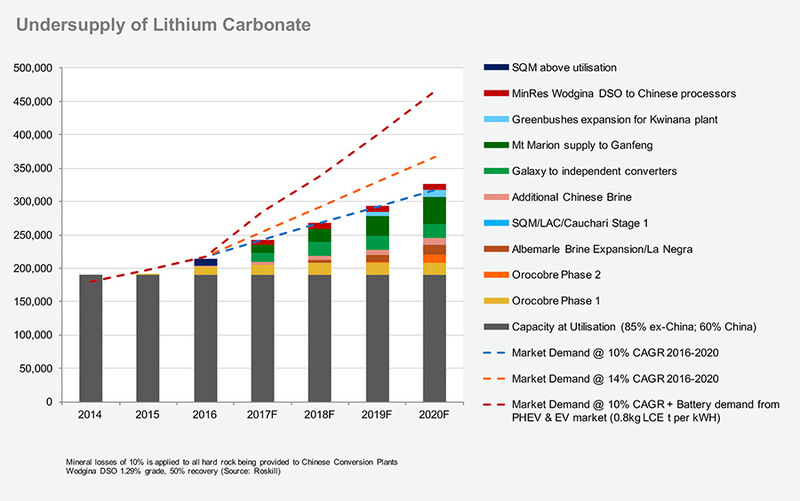 A review of lithium carbonate demand and the potential shortfall in supply beyond 2020. Key considerations when investing in junior lithium exploration companies. In the past year the automotive industry has produced dozens of headlines confirming a shift to electric vehicles. Nearly every major automotive manufacturer has released plans to integrate electric vehicles in their product offering by the end of the current decade. Further, secondary markets such as stationary electrical energy storage have also made headlines. Decreasing cost of lithium batteries has begun to impact the cost of various secondary applications. In parallel with the automotive industry announcements calling for more electric vehicles, the battery manufacturing industry has announced dozens of new "Giga" factories to meet the demand that is expected to occur in the next years. 2017 was a lithium boom year specifically tied to the automotive and stationary storage markets. Toyota Motors, BMW, Daimler, Volvo, Volkswagen, GM, Ford, Mazda and Tesla (NASDAQ:TSLA) amongst others have produced headlines committing to increasing electric vehicle production or announcing new electric vehicles. In some cases, automotive manufacturers have also announced new battery manufacturing facilities to ensure the supply chain is capable of meeting demand. LG Chem (OTCPK:OTC:LGCEY) announced plans to spend $1.6 billion in Poland to increase regional battery supply. California based Tesla announced plans to build 500,000 EVs in 2018 and achieve annual production of 1 million in 2020. Tesla has been active in the stationary energy storage market where the company won an order to build a 100MW utility scale battery park in Australia. Further, Britain and France have also committed to banning the sale of new petro and diesel vehicles by as early as 2040. The Chinese government in June 2017, introduced a draft regulation to assist automobile manufacturers to increase EV production by 2020. Collectively, all of these major announcements have allowed for an excessive amount of capital to flow into various aspects of the lithium supply chain. Looking further downstream, new capital has reached the lithium carbonate production and exploration markets. Several key existing lithium producers have announced plans to expand their existing facilities or have taken positions in smaller exploration companies to expand their property portfolios. Another segment of the market which has received significant attention from speculators is the junior lithium exploration community, who recently emerged from the woodwork looking to grab property titles and mining rights near existing lithium producers, such as in Nevada and Argentina. Today, there are only a small group of lithium producers who control the vast majority of global production and supply including: Sociedad Quimica y Minera de Chile SA. (NYSE: SQM), Albermarle Corporation (NYSE: ALB) and FMC Corp. (NYSE: FMC) (See: Lithium Mining - Reviewing Opportunities Within The Production Oligopoly). Albermarle has been expanding the "La Negra" Lithium brine facility with initial commercial product shipments expected to occur in 2018. SQM has partnered with junior exploration company Lithium Americas (OTCPK:LACDF) to develop Stage 1 of the Cauchari lithium brine project which is expected to add meaningful volumes in 2019. In recent years, FMC a global chemical company completed expansions Lastly, Australian based Orocobre (OTCPK:OTCPK:OROCF) is the only company in the past 20 years who has brought meaningful volumes of low cost lithium carbonate to market from a new facility. In 2017, Orocobre and project partner Toyota Tsusho (OTCPK:OTCPK:TYHOF) successfully delivered 11,000T LCE of the potential 17,000T LCE nameplate capacity. (See: Orocobre- The Road To Lithium Production In Argentina). In the past two years, dozens of lithium junior exploration mining companies have been formed or resurrected, with most of them able to purchase a property and raise capital to begin exploration. The same group of companies in the past year have seen dramatic increases in share price values due to general speculation within the industry. Some companies within this segment of the exploration market include: Lithium X Energy (OTCPK:OTCPK:LIXXF), Argentina Lithium (OTCPK:OTCQB:PNXLF), Frontier Lithium (OTCPK:OTC:HLKMF), US Lithium (OTCPK:OTCPK:LITH), Lithium Energi (OTCPK:OTC:LXENF), Millennial Lithium (OTCPK:OTCQX:MLNLF), LICO Energy (OTCPK:OTCQB:WCTXF), American Lithium Minerals (OTCPK:OTCPK:AMLM), Ultra Lithium (OTCPK:OTC:ULTXF), Southern Lithium (OTCPK:OTCPK:SLLTF), Lithium Exploration (OTCPK:OTCPK:LEXG), Rock Tech Lithium (OTCPK:RCKTF). To support the growing number of junior lithium exploration companies, one would assume a looming shortfall of lithium carbonate supply over the next years. As illustrated in the graph,"Undersupply of Lithium Carbonate", in a base case scenario there is no need for additional lithium capacity in the next three years. All of the existing major producers have already responded to future market conditions by mobilizing plans to expand production facilities or align themselves with explorers who are at an advanced stage, such as SQM with Lithium Americas. In April 2017, Orocobre and Toyota announced a rapid expansion plan to nearly double production by the end of 2019 (See: Orocobre's Rapid Expansion Plans In Japan and the Puna Plateau). Albermarle's La Negra brine expansion should deliver meaning volumes by 2019. Beyond 2020, there could be additional supply requirements that might lead to a shortage in the market but there are a number of variables which will impact the future situation. The single most important variable is the production and adaption of electric vehicles. Based on the mid and high case scenarios the global lithium carbonate market would already be in a significant shortage which is not the case. Although market prices for lithium carbonate have increased by 10% to over $10,000T/ LCE there has been no reports of material shortages. Further, the high case scenario is likely not to occur before 2020 as battery manufacturing facilities are being constructed in 2018 - 2019 to meet automotive delivery schedules in 2019-2020. Based on these supply and demand factors, there is no short-term need to bring additional capacity online. However, a lithium brine project takes approximately 7 years from exploration to commercial production. Considering that Orocobre and Toyota are the only companies who have successfully brought a low cost lithium brine to market in the past decade, it is fair to use this project as a benchmark. In January 2010, the companies began conducting a joint feasibility study for the development of lithium resources. In December 2012, mining rights and development authorization were issued by the Province. In August 2013, construction of the lithium carbonate plant began. In December 2014, a ribbon cutting ceremony took place which signaled the beginning of high volume production. In FY2017, the project only delivered 11,000T LCE of the 17,000T LCE name plate capacity. Conclusively, the full cycle to bring a new lithium brine from exploration stage to high-volume commercial production will take between 5 to 10 years with a major project partner involved, such as Toyota. Many of the exploration companies which have recently entered the market are purely speculative investments with little substances to support them. When investing in junior lithium exploration companies, it is important to identify companies targeting lithium brine projects rather than hard-rock as brine production is known to have a lower cost structure. The location of the lithium brine in proximity to existing lithium carbonate facilities is important as this will reduce exposure to political or environmental risks. A producing site nearby should indicate the availability of local expertise and regional infrastructure. Additionally, mineral chemistry are more likely to be similar to nearby deposits as is the case of Advantage Lithium's (OTCPK:OTCQX:AVLIF) lithium brine which is 10 kilometers away from Orocobre's Olaroz project. Most importantly, companies with strong project partners quickly eliminate much of the risk involved in obtaining project financing and necessary lithium expertise. In 2016, Lithium Americas and SQM announced a joint venture to bring the Cauchari-Olaroz lithium project in Jujuy, Argentina to market. Considering that SQM is one the premium global producers of lithium carbonate, they will bring a vast amount of known-how and capital to the project. In 2017, Advantage Lithium purchased non-core lithium brine assets from Orocobre, primarily in exchange for 30% of Advantage's common shares. Both Lithium Americas and Advantage are in excellent positions to expedite the process to bring their lithium brines to market by leveraging their project partner's expertise.